Phoenix Law Enforcement Association > PLEA News > Are The Police Racist & Do Facts Matter? Are The Police Racist & Do Facts Matter? Noted author Heather MacDonald is a Thomas W. Smith Fellow at the Manhattan Institute and a contributing editor at City Journal. She is a widely published author having authored numerous pieces that have appeared in the Wall Street Journal, the Washington Post, the New York Times, and the Los Angeles Times to name a few. She has also appeared on FOX News, CNN and other TV and radio programs. 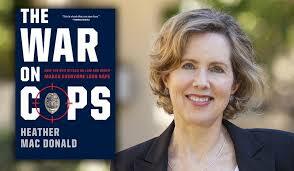 She is also the author of the recently released book The War on Cops, how the new attack on law and order makes everybody less safe. In the video below, produced in cooperation with Prager University, Ms. MacDonald, through statistical analysis shows that police by and large are anything but racist.